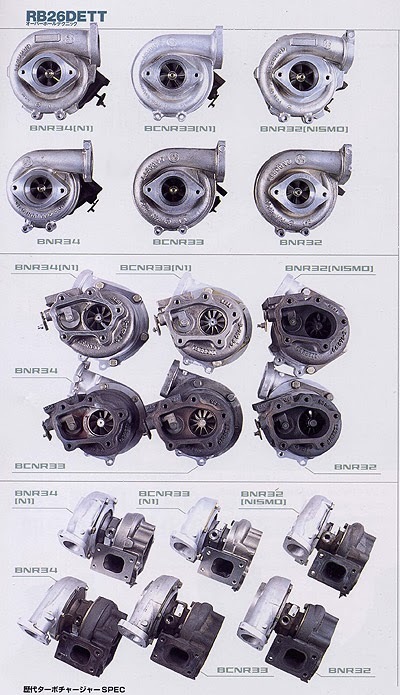 Above about 1.1 bar (16 psi) the stock RB26 turbos have a tendency to break the exhaust wheel off. People have gone low 12's, high 11's on the stock turbos, but not for long. 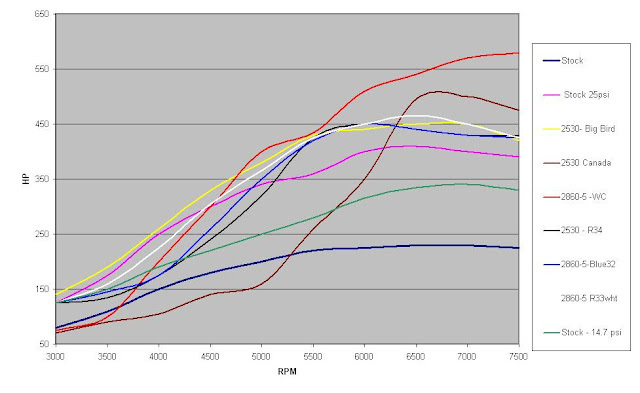 Stock peak boost R32 is about 0.8(11.5 psi) , R33 0.9(13 psi), R34 1.0 (14.5 psi). 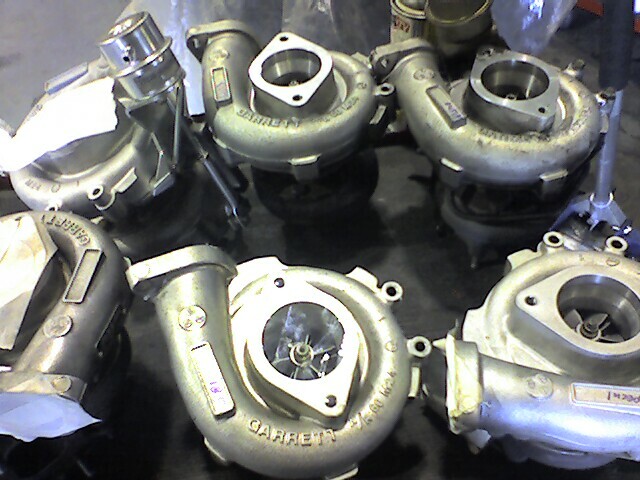 The exhaust manifold on the left side of the picture is a stock R32,R33, R34 piece. On the right is a modified N1 exhaust manifold from a Nismo built Super Taikyu car. You can see bracing between the manifold flanges, and the larger hole for the turbo “foot”. The N1 Super Taikyu car also used individual exhaust gaskets. The normal exhaust gasket is one piece for each three cylinders. - Use of this product requires adjustment of boost pressure and engine control unit before use. Billet wheels vs cast compressor wheels. 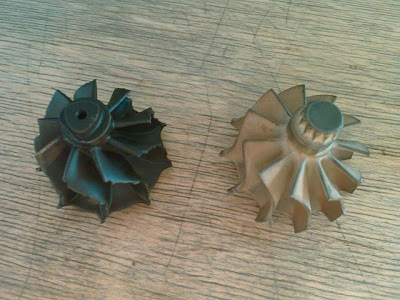 A Billet Compressor Wheel compared to a Cast Compressor Wheel offers NO GAIN in performance by its material alone. Some have argued that they can be made lighter for better spool, or that they can be made with more aggressive fin designed due to there better sheer strength. While that MIGHT be true, we have seen no conclusive evidence or study that has proven this so we have to rule it out for now and say it’s NOT FACTUAL even though it MIGHT be true. Billet wheels CAN, again that is CAN, perform better. Because they can be a low production run of wheels, there flow and performance can be tailored to running a specific pressure ratio (PR) or to have a certain amount of peak flow, or surge line capability, or be able to jump on new blade design technology faster since there is no need to delay the technology getting to market because of setting up machining and tooling.